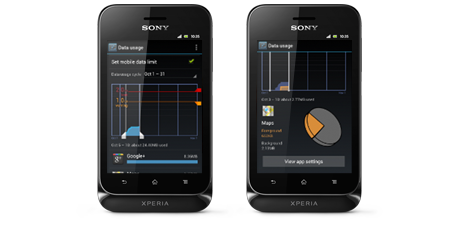 The Japanese phone manufacturer, Sony has finally entered the budget smartphones market with its own XPERIA TIPO & XPERIA TIPO DUAL which are priced at Rs.9,999 and Rs.10,499 respectively. The smartphone sports a small 3.2 inch-ed capacitive touchscreen display which is actually too small for an Android smartphone. The first thing you might notice about the smartphone is that it is too thick, the dimensions are 103 x 57 x 13 mm. But the handset is pretty lightweight with 99.4 grams and instead of coming with a plastic back, Xperia Tipo comes with a premium rubber coating on the battery cover. The display is reasonably bright, and the sharpness is also good. It has a reasonable 3 MP Snapper but there is no flash. Sony has been much more generous with onboard storage for apps too, with 2.5GB of available space. On the right side of the handset is a volume rocker, which can be used to zoom the camera and the left side has the power key and micro USB slot. The 3.5mm audio jack is at the top. On the flip side, the micro SD card slot alongside the SIM card slot are housed beneath the battery cover. 0 Respones to "SONY XPERIA TIPO Hands-ON"